On a recent 12-day Mediterranean Cruise that took us through the heart of the Greek Islands we were fortunate to have the opportunity to spend a day in beautiful Mykonos. I would venture to guess that most visitors to this picturesque island come by way of a cruise ship and to be honest it’s not a bad way to visit Mykonos. 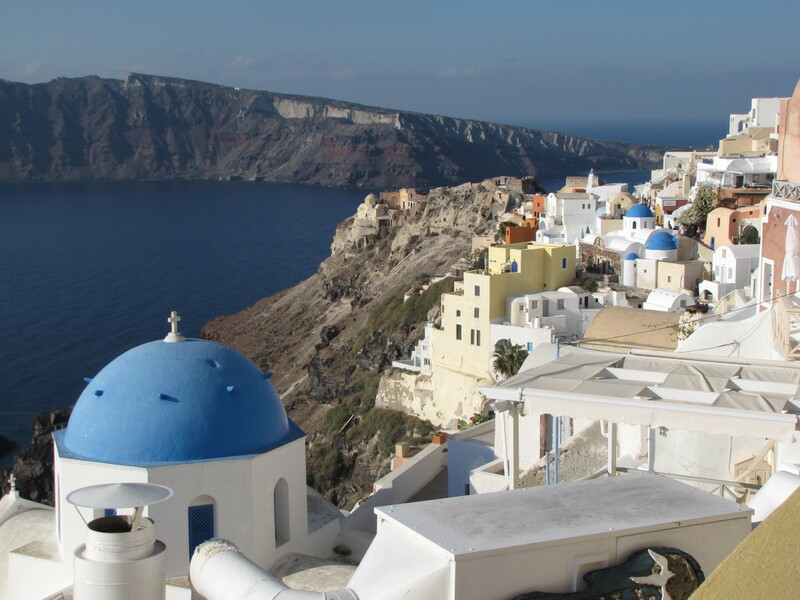 While one day is never enough to fully experience a new and interesting destination, it’s certainly enough time to get a taste of this popular Greek island. 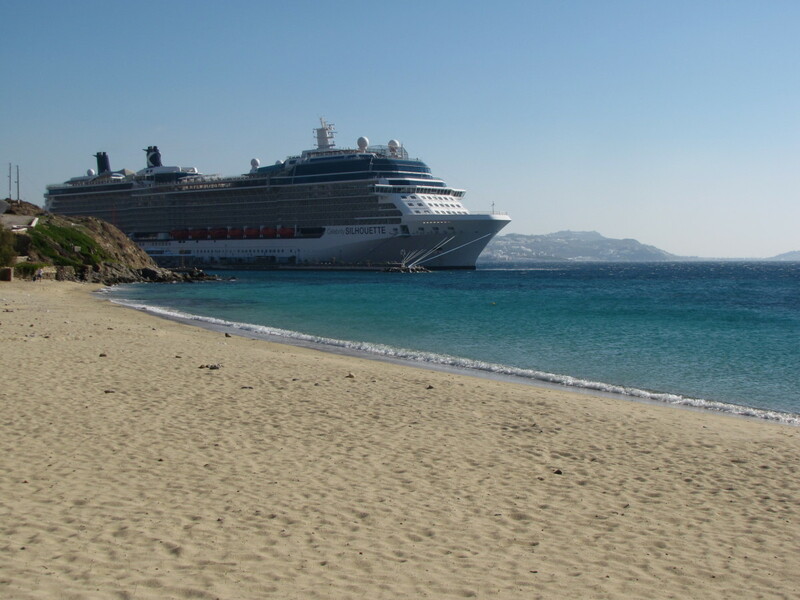 If your visit to Mykonos is not part of a cruise then it’s most certainly part of a beach vacation. 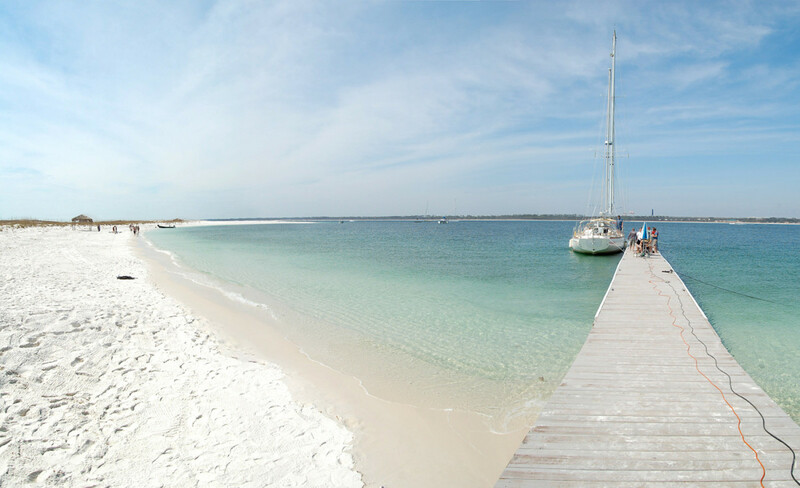 Known for its beautiful sandy beaches and it clear turquoise waters the island is dotted with a beach to fit every taste. From family friendly spots to beaches with a party-like atmosphere, Mykonos has it all. And while many visitors flock to the more popular beaches of this very sunny island you would be remiss to not spend at least a few hours exploring beautiful Mykonos Town, the hub of activity on this idyllic Greek Island. Mykonos is part of the Cyclades Islands of Greece and has just 10,000 permanent residents, most of whom live in Mykonos Town. Not being a fan of cruise ship tours or excursions we decided to venture out on our own for a day in Mykonos. Our first priority was to explore Mykonos Town and we quickly hopped on the early bus for the ten-minute ride into town from the port. Mykonos Town is everything one would expect from this quintessential Greek Island community. Oh sure, there are more than enough touristy shops catering to the day trippers looking to leave a few euro behind, but for me the sheer beauty of the town is what struck me. This place is stunning. From the white-washed buildings to the blue and red domes that dot the town it’s an absolutely lovely place to explore on foot. 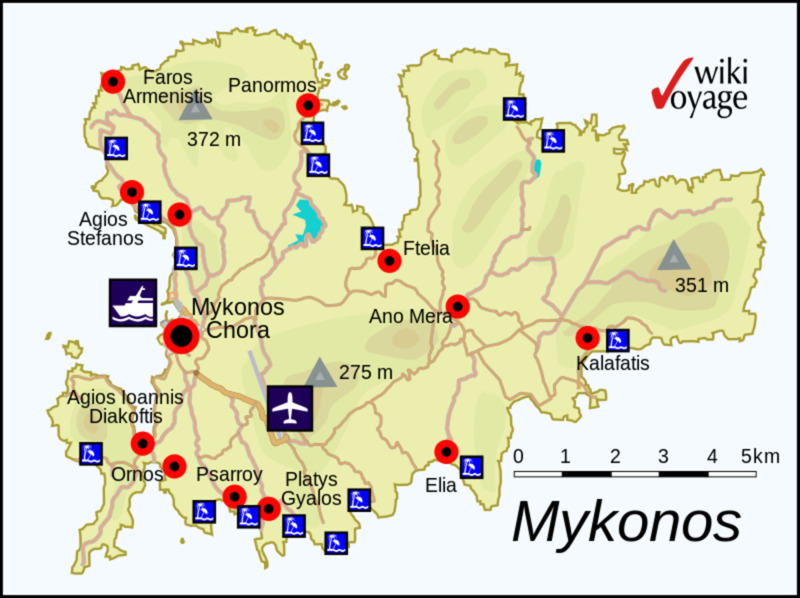 Mykonos Town is also known as Chora. The small harbor of Mykonos Town is a photographers dream with bobbing sponge boats and fisherman coming in with their catch of the day. The bright Mediterranean colors seem to just explode against the white washed backdrop. 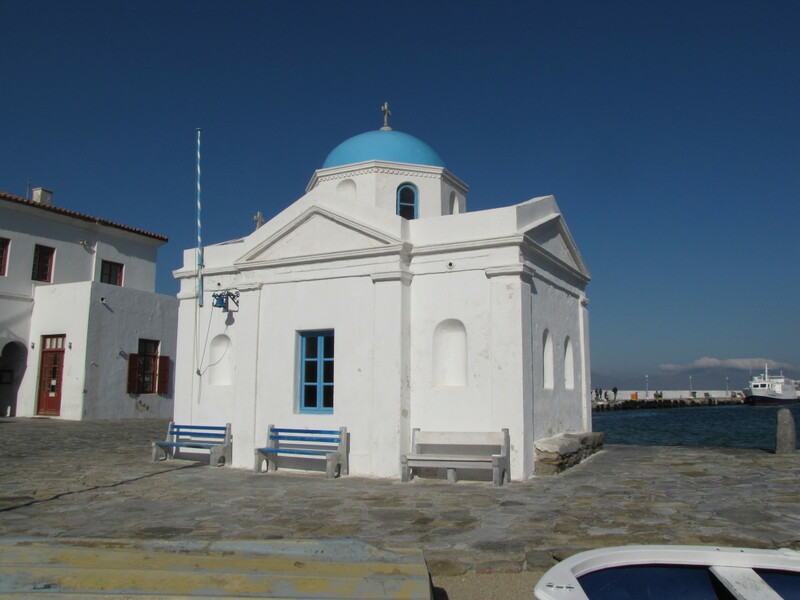 As you walk along the harbor front you will come to the small Agios Nikolaos blue domed Church (Church of Saint Nikolaos). If you’re lucky you might also catch a glimpse of Petros the Pelican in the area. Petros is the islands adopted mascot and the pelican’s story goes back to the 1950s when the bird was rescued by a local fisherman. The original Petros died in 1986 but the island has continued to embrace the legend with three new pelicans that call Mykonos home and are treated like local stars. 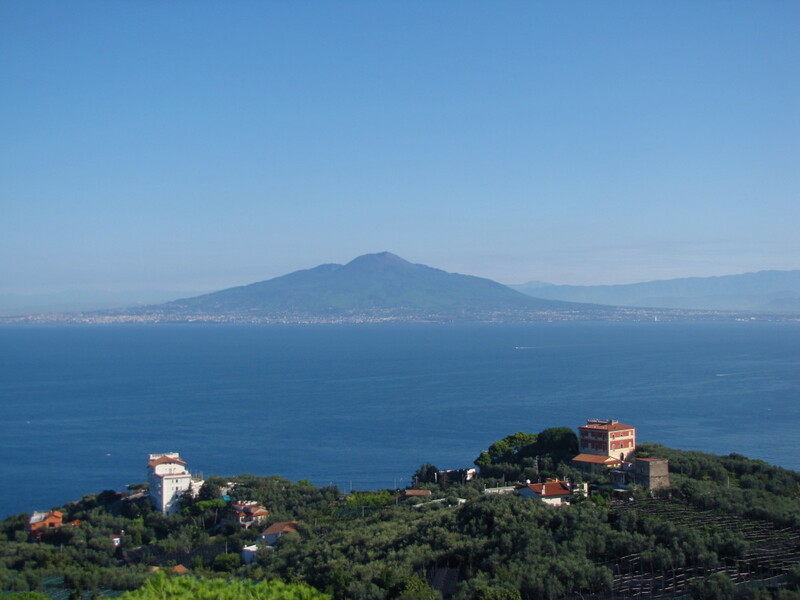 As you cross the harbor front and head into town toward the Windmills you will come to the most famous church on the island, the Panagai Paraportiani. This Byzantine treasure dates back to 1425 and is the most visited and photographed church on Mykonos. The church is actually five churches with four of them attached and forming the base for the fifth main chapel that sits on top. Paraportiani is one of the most unique architectural buildings in Greece and is an active church so be respectful when visiting. 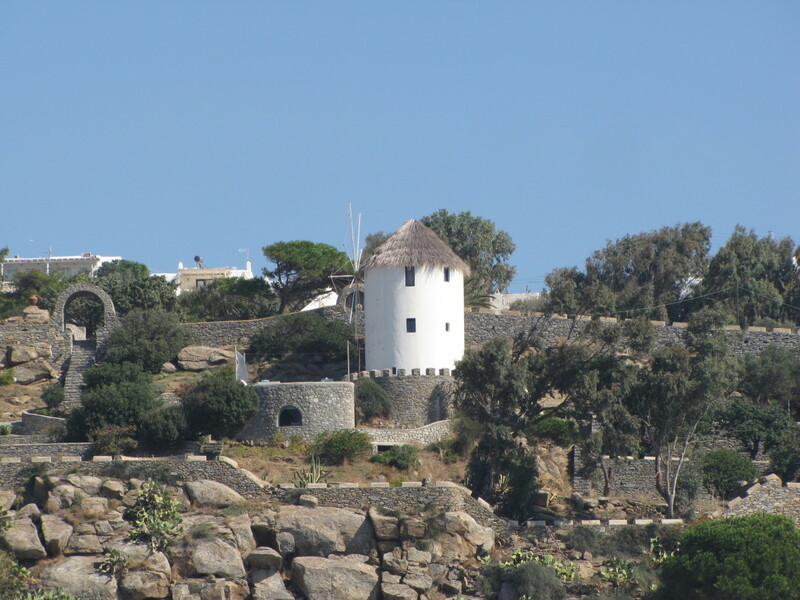 Between the Panagai Paraportiani and the famous Windmills of Mykonos you will pass though some of the most beautiful sections of Mykonos Town. Narrow alleys lead you to stunning glimpses of the sea and to colorful shops preparing to greet the day’s visitors. 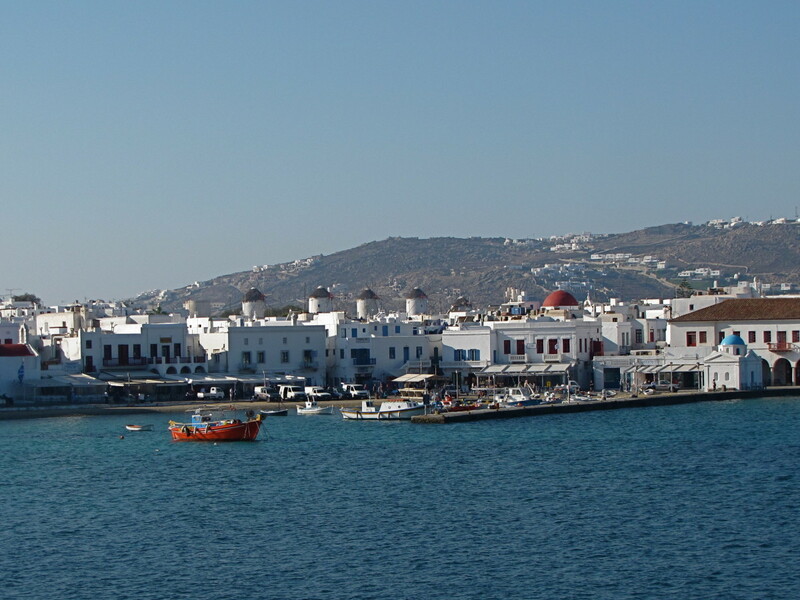 This part of Mykonos is referred to as Little Venice and is known for its medieval houses that sit right on the water. 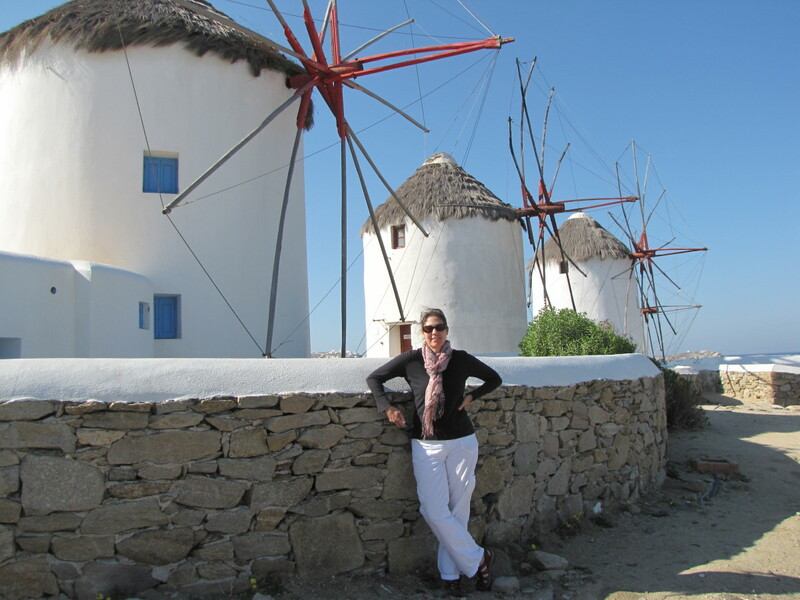 And just when you thought you were lost in the maze of Little Venice you come to the town’s most famous landmark, the Windmills of Mykonos. Perched on a hill that offers stunning views of Little Venice, Mykonos Town, and the sea, this area was the final destination on our walking exploration through Mykonos Town. Although they are not functioning today, the windmills harken back to a day in the 16th century when they were used to mill wheat. Five of the islands remaining sixteen windmills are located here and due to their position on a hill looking north over the town they are pretty much the first thing to catch your eye as you enter Mykonos. Having completed our journey we headed back to the harbor front via a different path. Our journey took us past the only Catholic Church on the island located in Alefkandra Square. 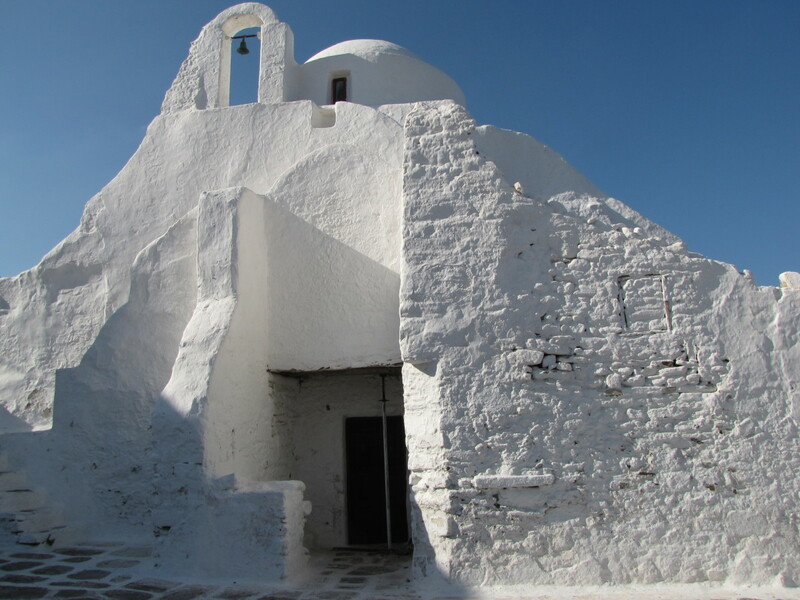 Churches are a common theme here in Mykonos and the island is dotted with over five hundred so don’t plan on trying to visit them all. 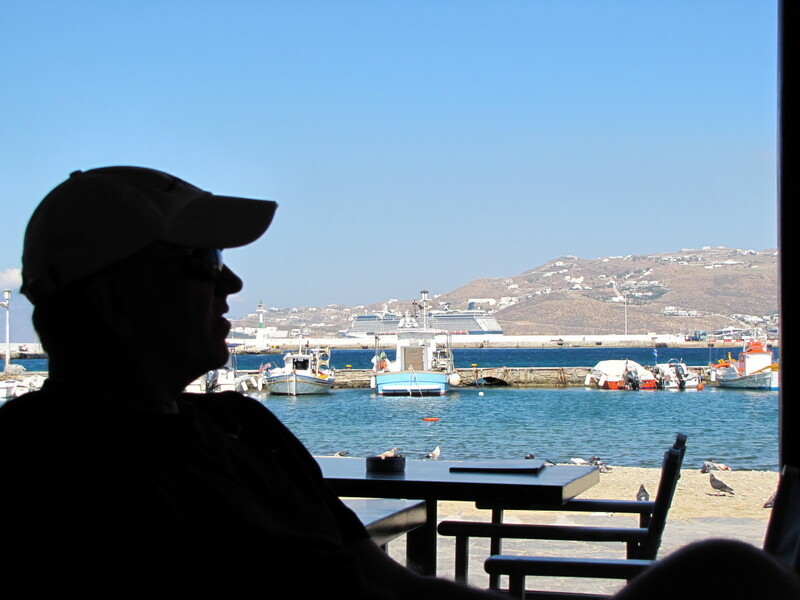 With the morning hours spent touring Mykonos Town it was time to refuel and we quickly found a lovely outdoor café right on the harbor front. I’m sure we could have researched Mykonos restaurants to find “the place” for lunch, but for a quick drink and a snack we were certainly more interested in the view than the write-up and the RAYA Cafe was more than adequate. We had a wonderful sampling of Greek food washed down with a Greek beer and we were happy. After our quick break we headed back to the bus stop for the quick ride back to the ship to prepare for a run to the beach. With beach options galore on Mykonos we decided to explore the tiny beach that we noticed just north of where our cruise ship was docked. Of course we could have taken a quick taxi to any number of the more famous beaches but from the ship this small beach looked just fine and it also looked empty. Perfect! 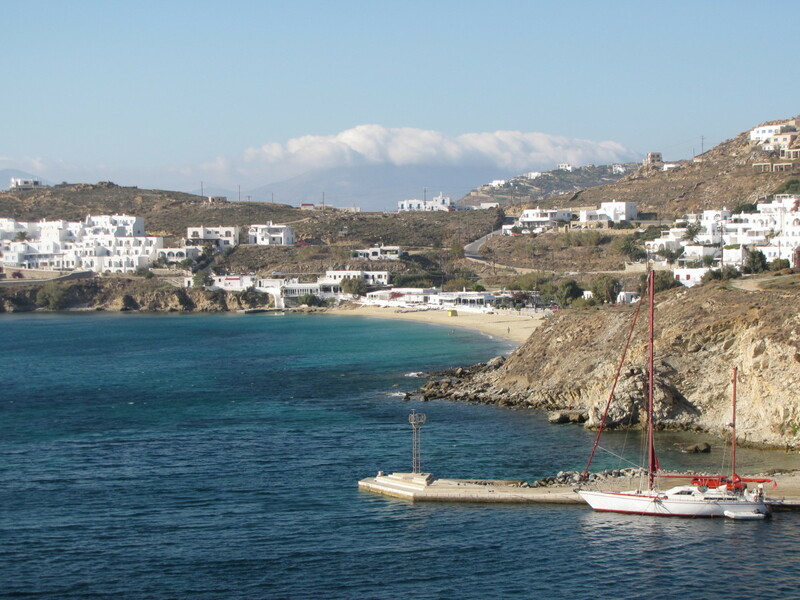 Mykonos is a naturally dry island that receives over 300 days of sunshine each year. The only rainy months are February and March. 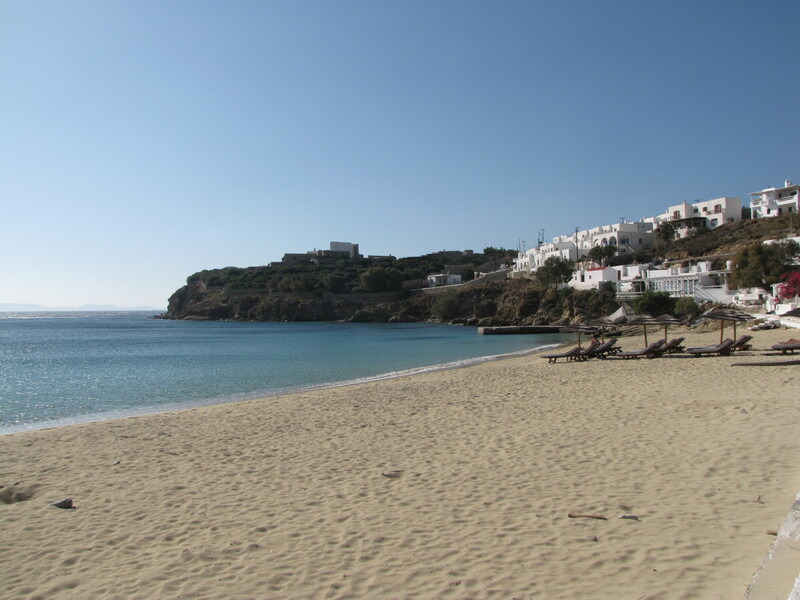 The fifteen minute walk to the beach revealed that we were upon the Agios Stefanos Beach. The write-up on this beach says that it’s a great choice for those with limited means of transportation and it has a tavern-bar right there with facilities so it wound up being a great decision. Sure, we didn’t come home with stories and photos of the famous Paradise Beach but to be honest, I’m really not that into the famous, most visited beaches where I’m fighting crowds. We had the beach all to ourselves and with a great view of our ship nearby it turned into a picture-perfect afternoon. With the sun starting to dip and our ship scheduled to leave at 6 p.m. we reluctantly headed back to the Silhouette, our home for this 12-day Mediterranean Cruise. 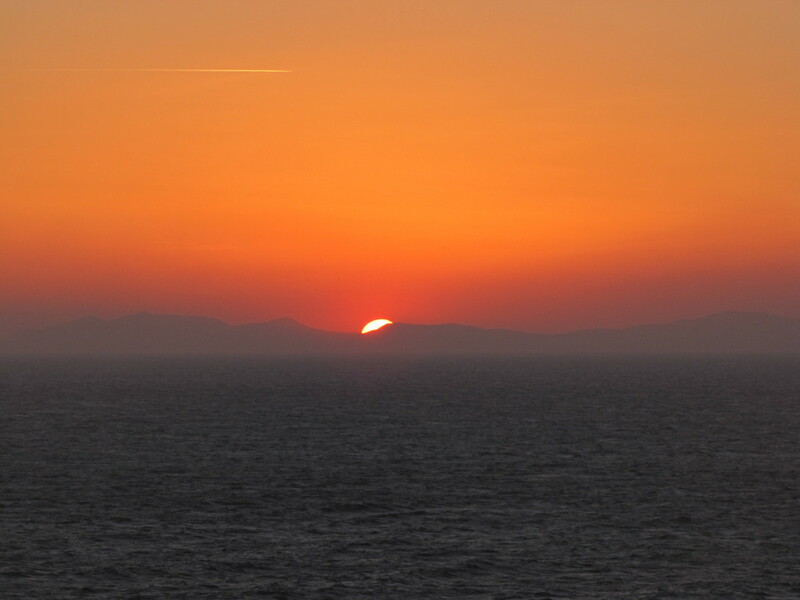 As the ship set sail away from Mykonos we were treated to another gorgeous sunset and we bid ado to this stunning destination. I hope you enjoyed our "One Day in Mykonos". Looking back we were pleased with our choices for the day. A morning exploring Mykonos Town followed by an afternoon at a beach that we had all to our own. The perfect day in Mykonos. Hi Monis Mas. It certainly is. Just another beautiful Greek island. Thanks for stopping by, have a nice weekend. I think I've already mentioned that I went on a Greek Island cruise many years ago with my Aunt so I am loving these hubs. I bet we went to almost all the same islands. This one was so beautiful. 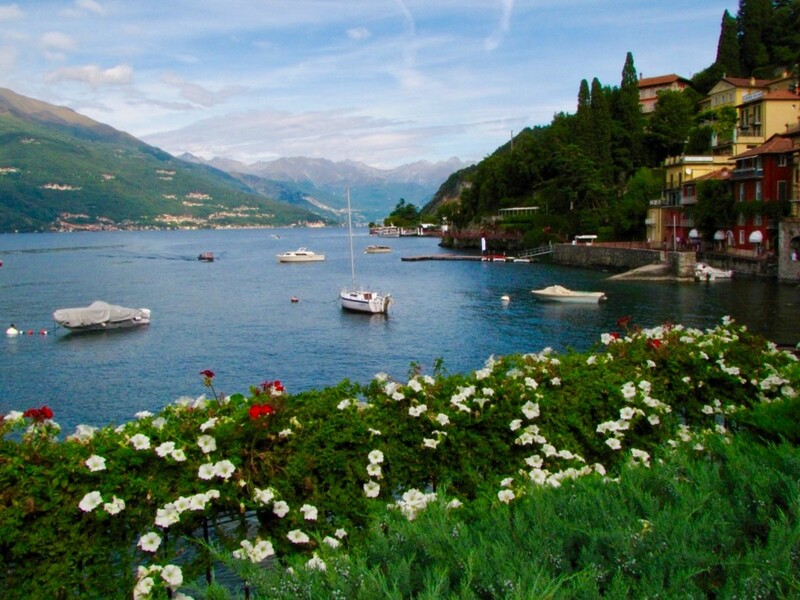 I loved just roaming the narrow streets and I remember having lunch along the sea and having a huge bowl of the best yogurt I have ever had, topped with honey. Now I see greek yogurt everywhere, but back then, I did not know what a difference it was. Anyway, shared around and dreaming of another trip! Beautiful hub. Hi carter. It continues to amaze me how many beautiful places there are in this world to see. Mykonos certainly is one of them. We really enjoyed our day there, wish I were there now :) Hope everything is well down-under. Have a great weekend. Hi gypsumgirl. Mykonos was a wonderful place to spend a day. We really enjoyed our day there. I'm so glad you had an opportunity to experience the magic of the Greek Islands. Thanks for the visit and have a great day. 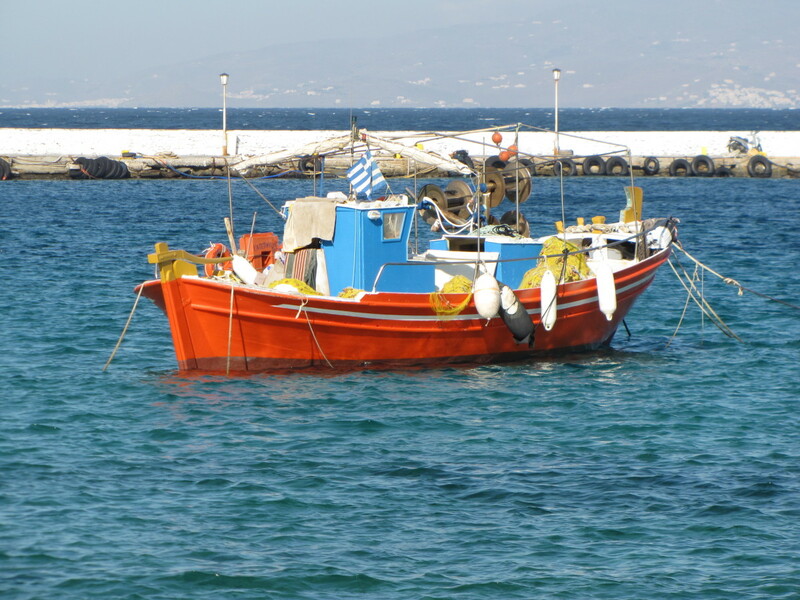 Thanks for sharing your day on Mykonos. 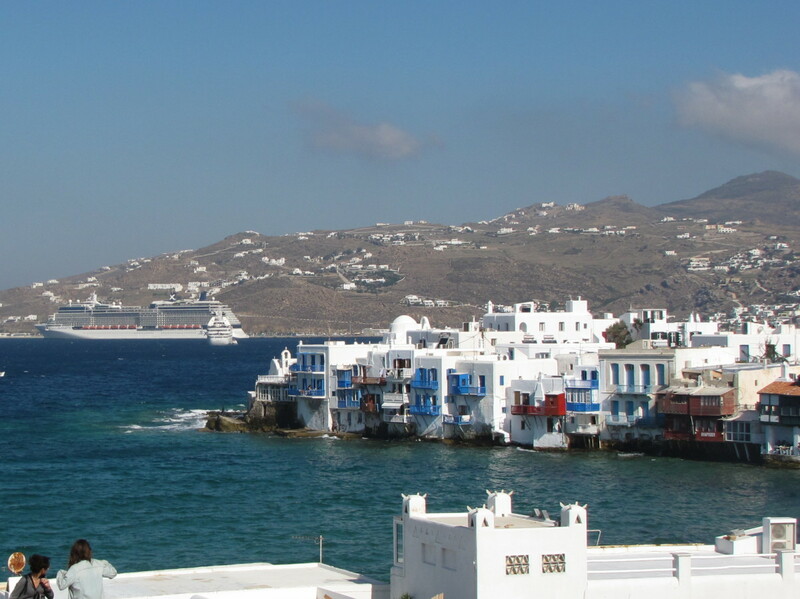 I also had the fortunate experience of stopping in Mykonos for the day last summer -- on a Mediterranean cruise. You've helped bring back some awesome memories. Hi Joelle. I completely agree with you. With just one day you get a nice taste but just don't have time to really explore. We would like to go back also someday, but, as you mentioned there are so many other places that we want to visit. Hence the predicament. Thanks so much for stopping by, have a great weekend. 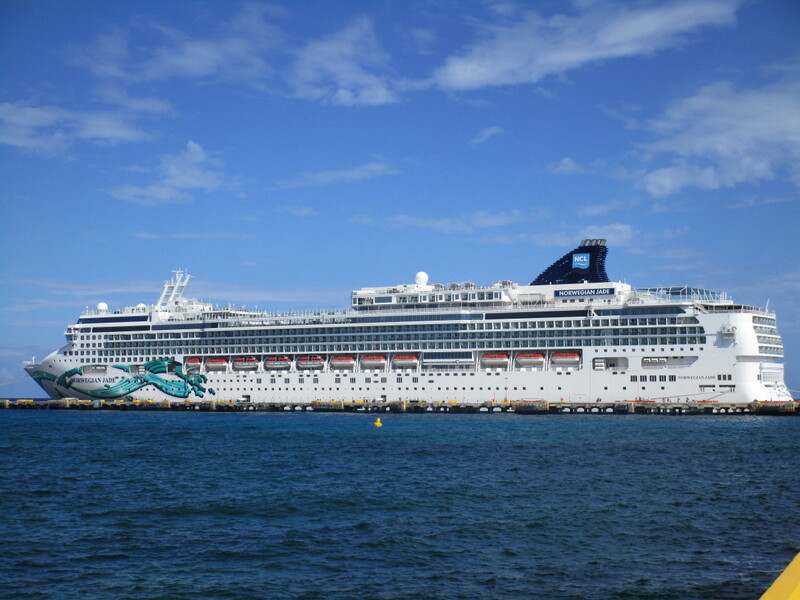 I agree with you that with a cruise, one day is never enough to discover those little gems but it gives a nice first taste. I visited Mikonos during a cruise as well but one day I would like to go back and go at my own pace from one island to the other. I hear it was possible to do it and stay in hotels. But there are so many other things to discover around the world as well.... where to start? Hi Devika. Thanks for stopping by and glad you enjoyed Mykonos. It was a wonderful day. We'll have to go back some day when we can explore a little more. Have a great weekend. One Day in Mykonos, Greece sounds a wonderful trip and the photos are so beautiful. Thanks Sheila. It was an amazing trip. So many highlights! Between Athens and the islands there was so much to see. I would go back in a heartbeat. What an amazing trip this must have been! 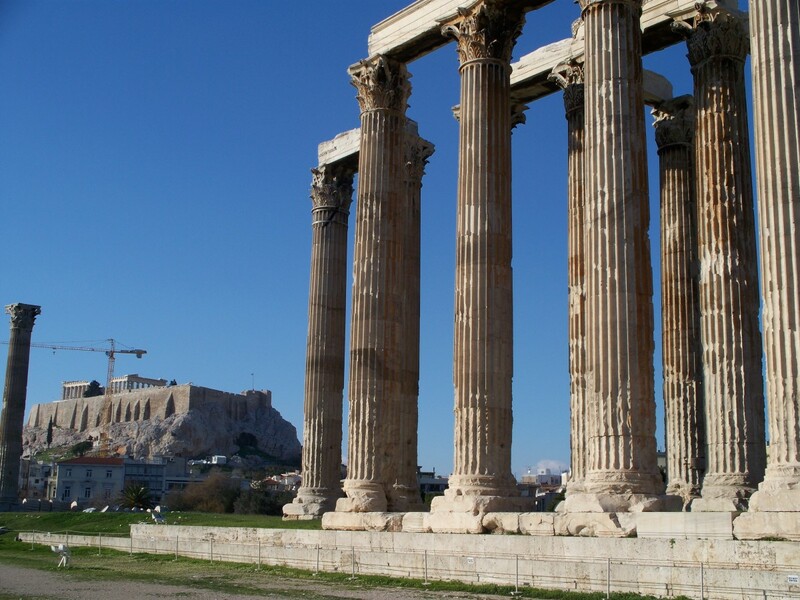 I have always wanted to visit Greece. Your pictures are amazing and I love the views through your camera! Thank you! Up and awesome! Hi Flourish. Thank you. Mykonos was a wonderful place, we really enjoyed walking the town and exploring its alley's and it was great to have a beach all to ourselves. Those beach photos are fabulous (the sunset!!). You've provided a useful and enticing description of a place I never knew I wanted to visit until now. Pinning to my travel board, and voted up+++. Hi again Adventure Lover. Thanks for stopping by. Greece was amazing. Glad you enjoyed the tour. Have a great weekend. What a lovely place! I'd love to visit Greece one day. Hi Shelley. Thanks for stopping by. It is a magical place. We really enjoyed the Greek Islands that we visited. Have a wonderful weekend. Hi Linda. Thank you. There really are so many beautiful and interesting places to see. Mykonos was a very pretty little place. Maybe not as picturesque as Santorini but still beautiful. Have a great weekend. Oh how beautiful, the romance and wonder of the Greek Isles. Thank you for making me dream. Mykonos is another place that I'd like to visit now that I've read your hub, Bill! 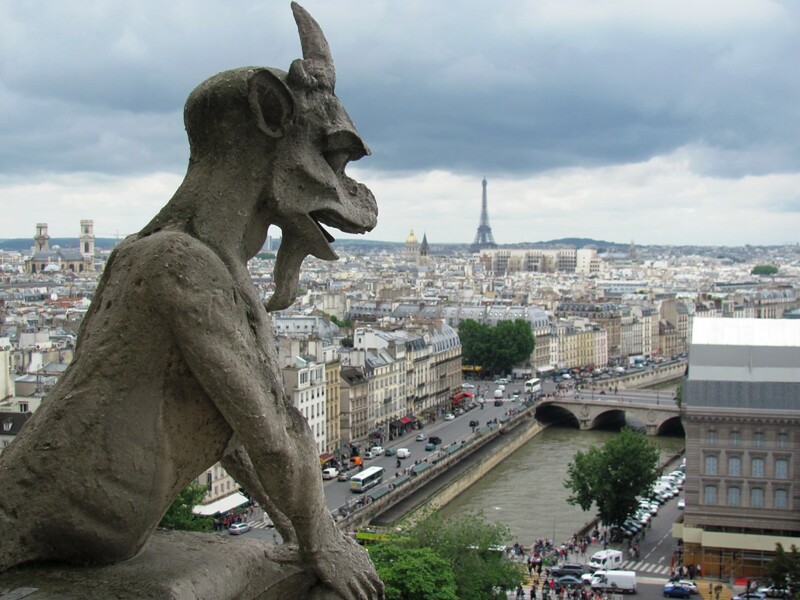 Europe is so fascinating. 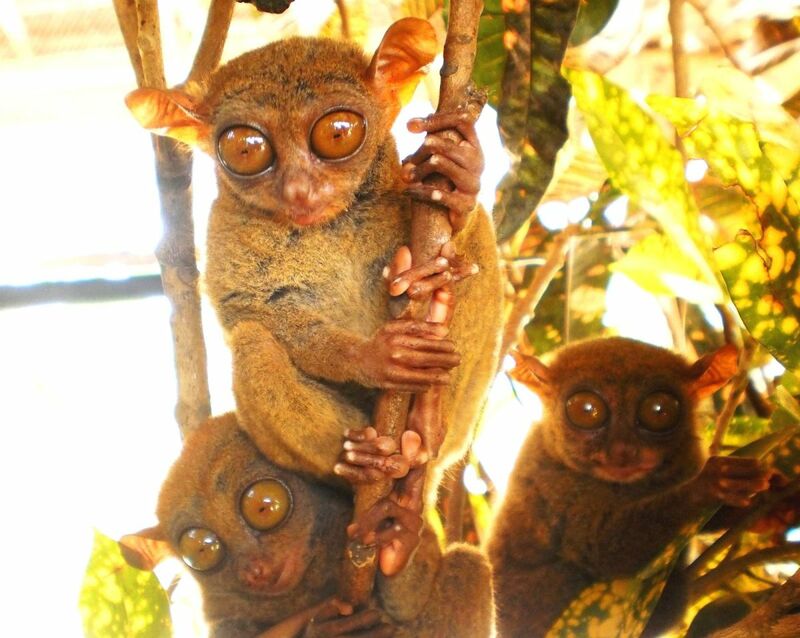 Thank you for sharing the interesting information and the lovely photos. I enjoy reading your travel articles very much. Hi Lenzy. Thank you. The windmills certainly make for a great photo op. 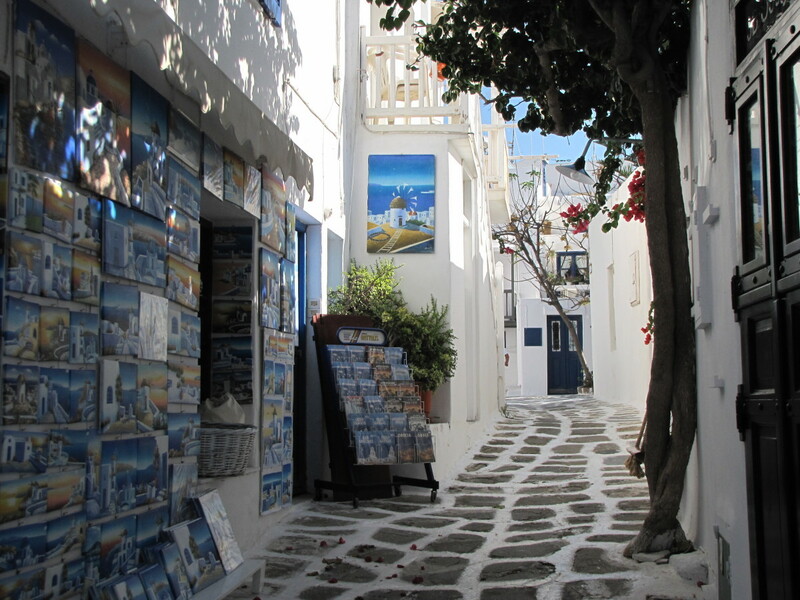 We loved the narrow alley's of Mykonos and all the white-washed buildings. It's a very pretty place. Thanks of much and have a great weekend. Hi kerlund74. Thank you and welcome to HubPages. Glad you enjoyed Mykonos. It's a beautiful place. Have a great weekend. So wonderful photos in this hub, love it! Stunning as always. Do the remaining windmills serve a purpose now or are they just for show? What a beautiful place....thanks once again for whetting my appetite. One day I'll make it to Europe.